If you're looking for an RV to fit your family of five, this travel trailer with a large slide out will be perfect for you. Within the slide out you'll find a sofa that can also be converted into additional sleeping space. There is a wardrobe with a bench so you can store your shoes and jackets and have a place to sit to put on those hiking boots! The dinette includes a removable resin outdoor table and the rear kitchen has all the amenities you need to prepare a home cooked meal. 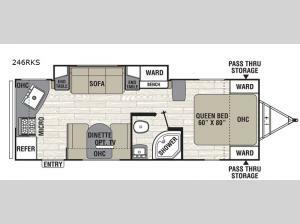 This unit features a front bedroom with a queen bed and privacy curtains so you can enjoy your own space.